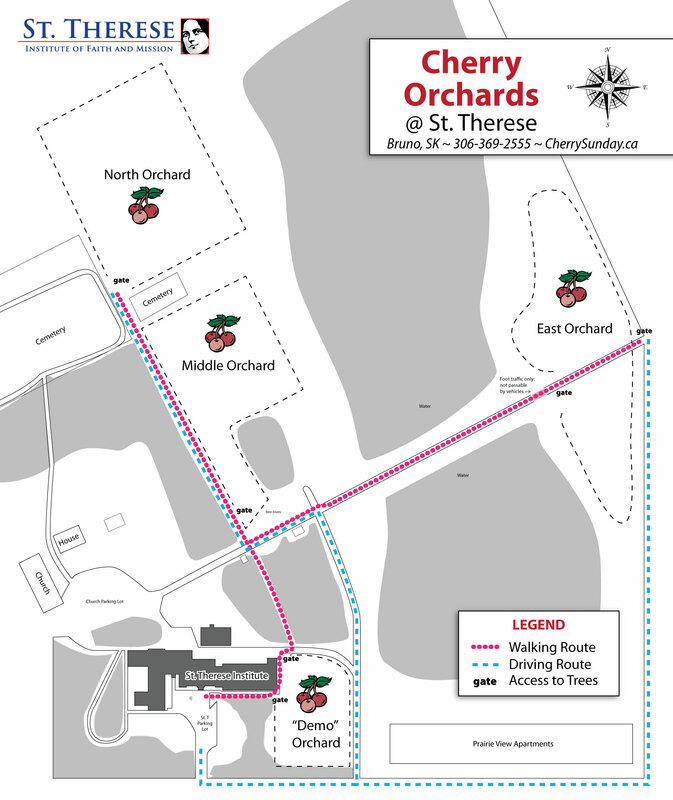 Cherry U-PICK ORCHARD IS OPEN!! ORCHARD OPEN FOR PICKING as of Monday, July 31, 2017! HOW TO U-PICK: Picking is self-pay and BYOB (ahem... that's bring your own 4L BUCKET). Come to the front door of St. Therese Institute at the north end of Main Street in Bruno, SK, and ask us for information on where to pick (during office hours) or follow the posted instructions and signs (after-hours). Payment can be 1) made at the St. Therese office during office hours (M-F 8:30am-12pm, 1pm-5pm), or 2) deposited in a drop box outside the front door of St. Therese after hours. HOURS: You can pick any time during daylight hours, 7 days per week. See note on payment above.